Perfect as an everyday accessory or ideal as part of a layered look, this sterling silver bangle is a jewellery box essential and a great way to prepare for a gorgeous summer style. Featuring a unique hammered look, this bangle gives a subtle style and offers just the right amount of shine. 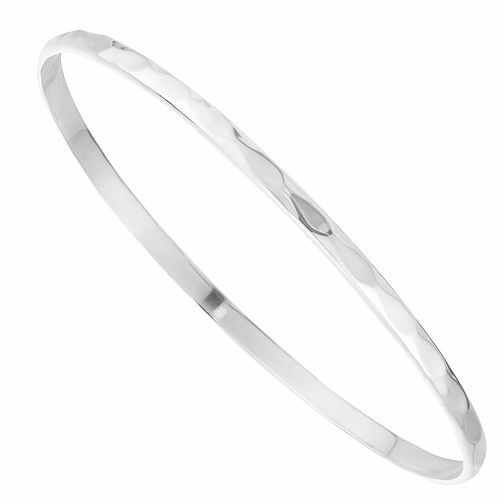 Sterling Silver Hammered Effect Bangle is rated 5.0 out of 5 by 2. Rated 5 out of 5 by Anonymous from Beautiful Had 2 bangles bought with my birthday money and i love them, they look very stylish and i hope to add to them as i think 4 would look very good. They are very strong so i leave them on all the time. Very happy with my purchase. Rated 5 out of 5 by Anonymous from Really great finish on this bangle stands out!! Amazing product turned up in an amazing box and was just as stunning when you opened it. The girlfriend has several of these but this one stands out. Quality is amazing.